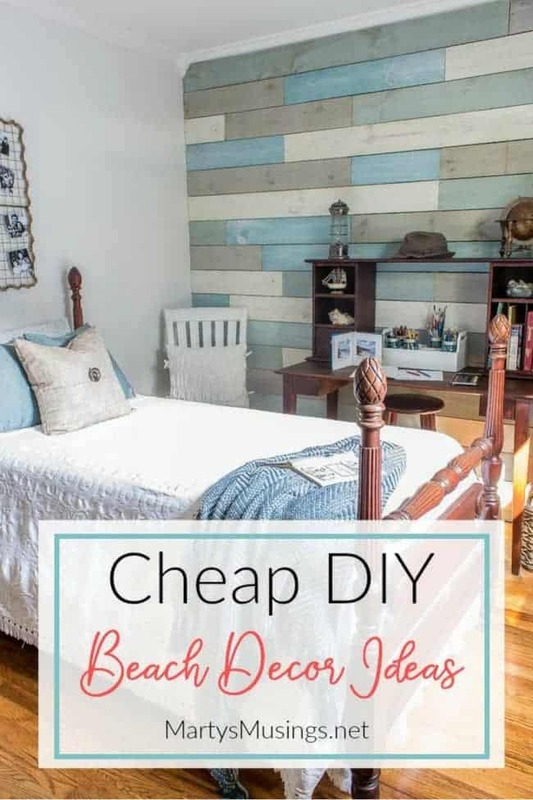 Create a soothing coastal bedroom retreat with these inexpensive DIY beach decor ideas including a plank wall and yard sale treasures! I’ve shown bits and pieces of this room over the last several months but I haven’t ever done a full “reveal” or answered some of the reader questions I’ve received. There’s a bit of a complicated story behind this now beautiful room. If you’re a new reader in the past couple of years you may not realize I started Marty’s Musings as an adoptive mom blogger, writing about my journey parenting my kids with wounded hearts. It was an outlet to record our family’s history and struggles while encouraging others along the way. Little did I know what God had in store as I also began sharing a DIY project here and there. The response was amazing and my talented hubby and I got hooked (ok, I got hooked and dragged him along for the ride!) 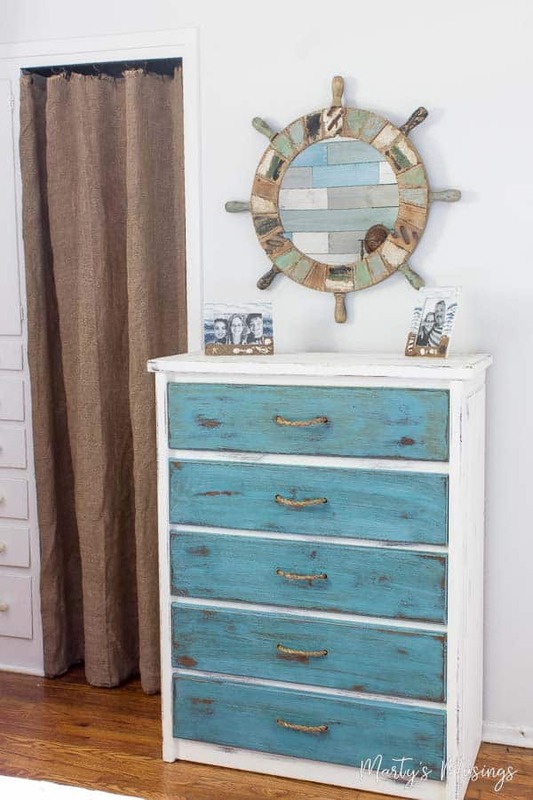 on transforming our home on a budget with repurposed treasures. My blog grew and I discovered a new career as I transitioned from homeschool mom of 23 years to full-time work at home business woman. Along the way I knew I needed to keep some of the more personal details of our family life private yet I still believe God has called me to share my messy life as transparently as possible as an encouragement to other families to hang on when life gets tough. Every family is worth believing in and fighting for. 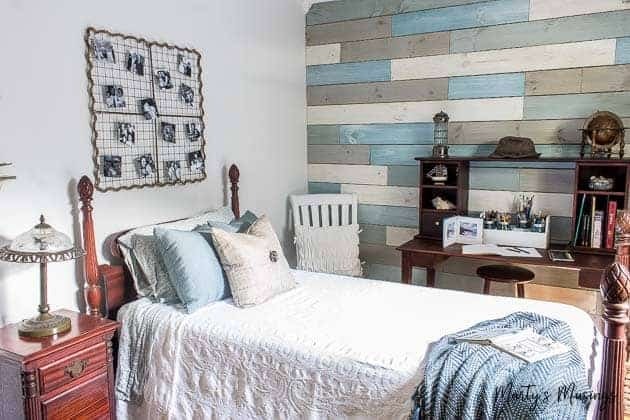 What in the heck does that have to do with this lovely beachy bedroom makeover? I’m glad you asked! 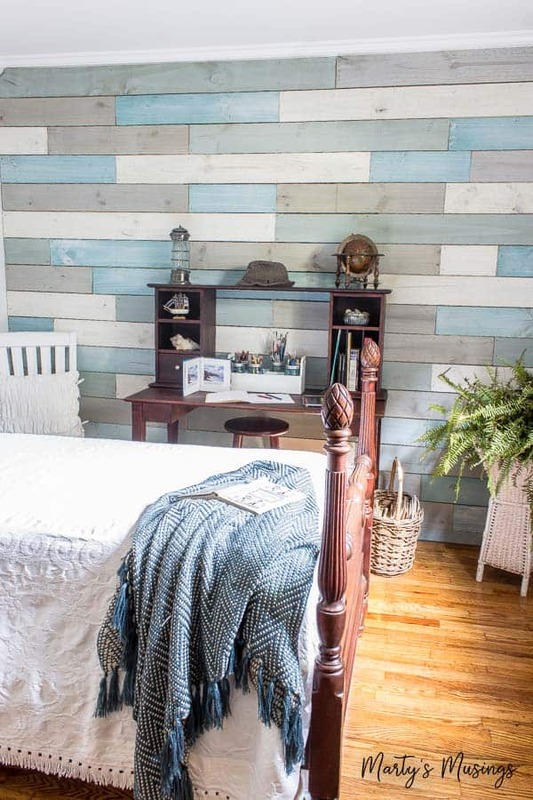 This bedroom belonged to our youngest adopted son and was painted bright red with one wall chalkboard paint (hiding behind ALL.THAT.STUFF.) 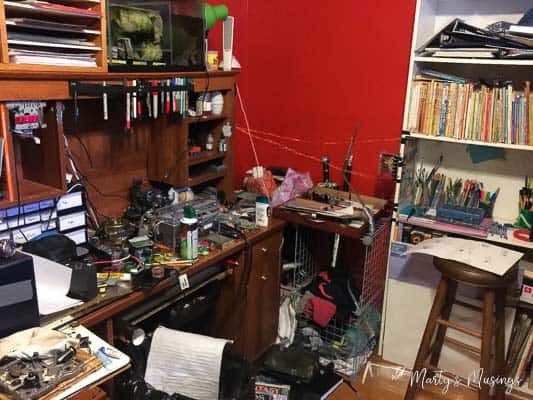 The condition of his room matched the struggles in his heart, messy and conflicted. 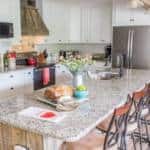 When he left he told us he never wanted to come back home to live so I transformed the chaos into a room where peace and love reigned, whether my son one day visited for a night or longer periods of time. For me it was a way of dealing with the heartbreak of years of pouring into the lives of our adopted children yet feeling at times as if we were still losing the battle for their hearts. I transform things. It’s what I do. Whether it’s a wounded heart in need of love or a piece of furniture someone else has thrown out, I see beauty in brokenness. Read on to the end for the rest of the story! 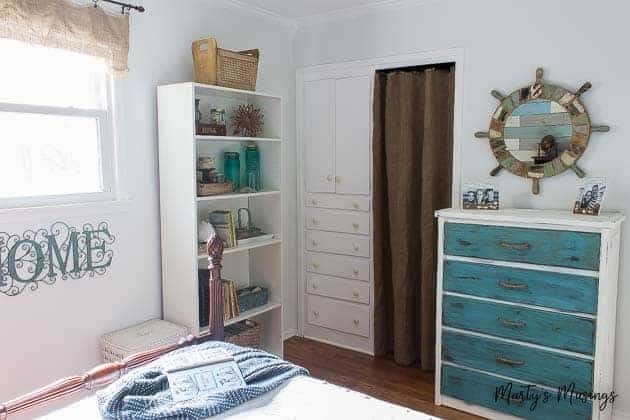 All of the bedrooms in our 1950’s ranch style home are fairly small and a challenge to decorate yet still serve a purpose. 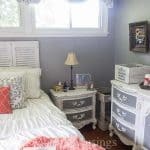 Each one is filled with yard sale treasures and curbside finds I’ve repurposed to create a beautiful room on a budget. My starting place for this room makeover was this rustic “relax” sign I found at a craft store. You can read all about how I designed the entire room around this one item here. 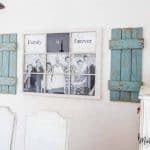 I was drawn to the beachy blue colors and then created this gallery wall with simple artwork. The picture of the Cape Cod house was one I stitched almost 30 years ago. The ship on the right was painted by my son and the other two were yard sale finds. 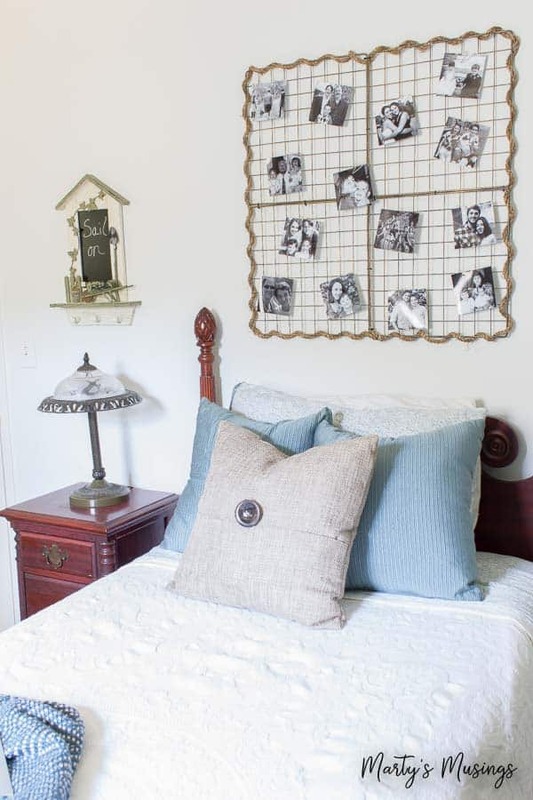 A simple grouping of similar themed pictures works for this room. 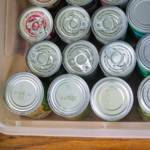 The easiest way to refrain from spending a lot of money is to recycle the “stuff” you already have. 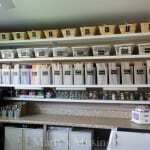 Everything on these shelves came from……..wait for it……a yard sale or from my attic stash! The bedroom furniture in this room was actually my grandmother’s. She lived with my family until her death when I was 15 and this was her four poster bed and nightstand. We stored it for many years in the attic but now it’s perfect for this small bedroom. 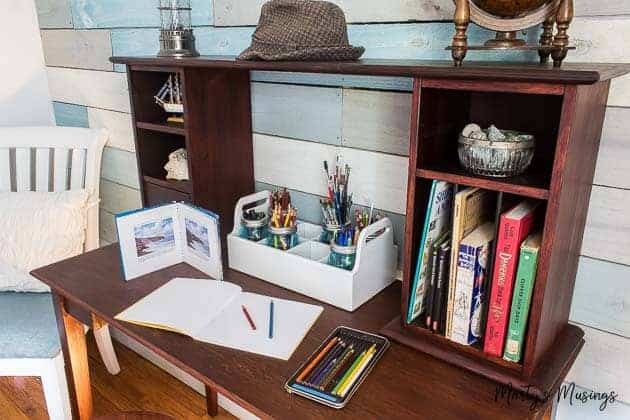 You’ll never guess where this gorgeous desk came from. The side of the road, of course! Trash to treasure projects are my favorite! Tim spent a lot of time mixing stains like a mad scientist to match the bedroom set and he did a great job! The hat lovingly placed on the top shelf was my dad’s. It brings joy to my heart with memories of my kids placing dress up with one of PawPaw’s hats. 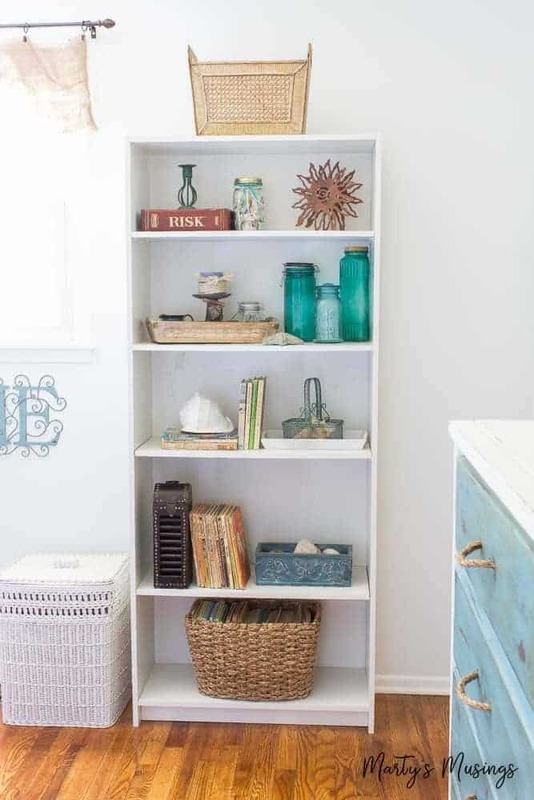 Sprinkled in with the rest of the inexpensive decor are some shells and books for boys of all ages. 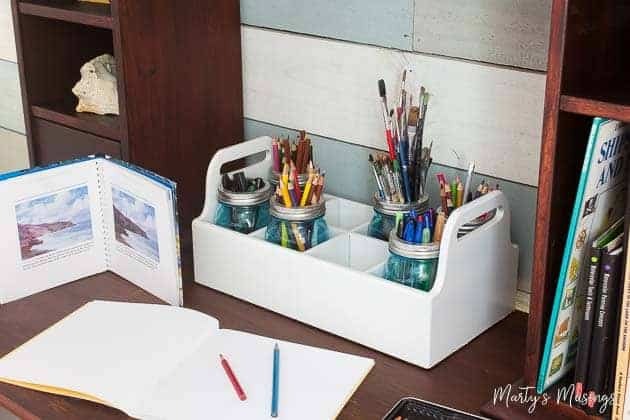 Another $1 yard sale find, I painted this tool caddy white and used it to store art supplies in blue mason jars. 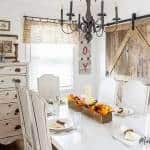 Since we planked over the door adjoining this room and another bedroom some of my readers wanted to know how to get in the room! 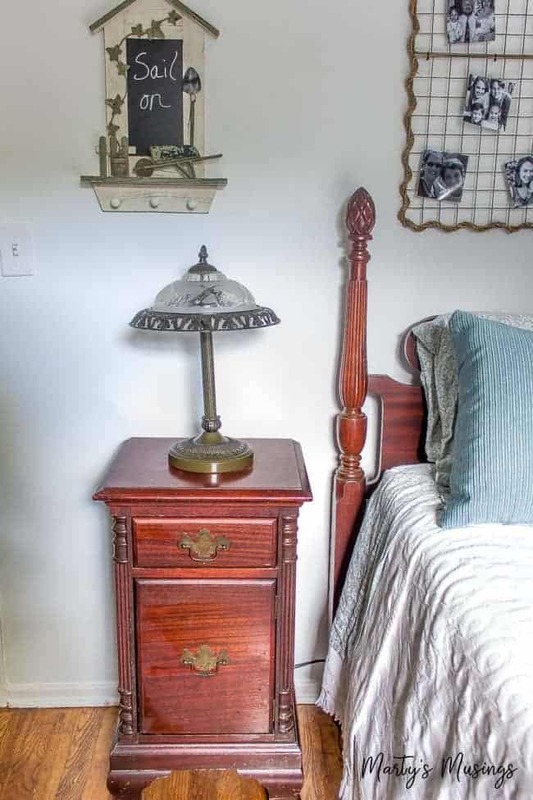 The door is actually to the left of the side table in the picture below so there an escape out of the room! 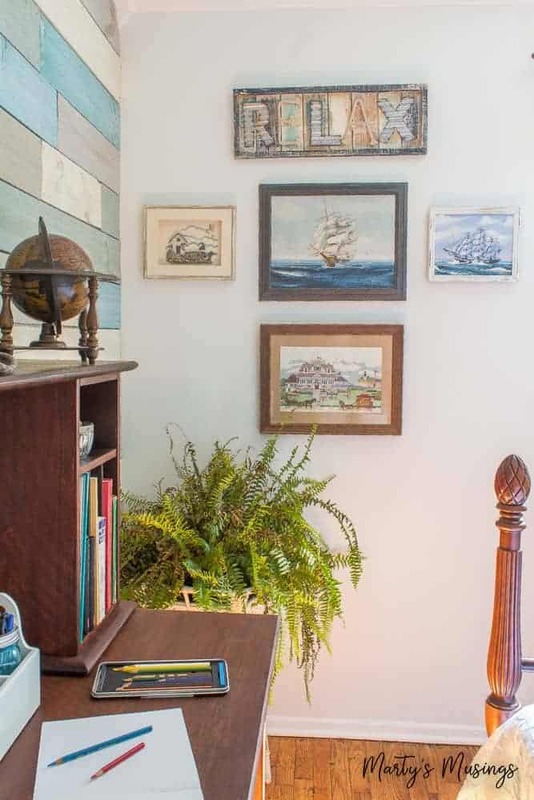 No one was locked in to make this coastal cottage retreat possible! 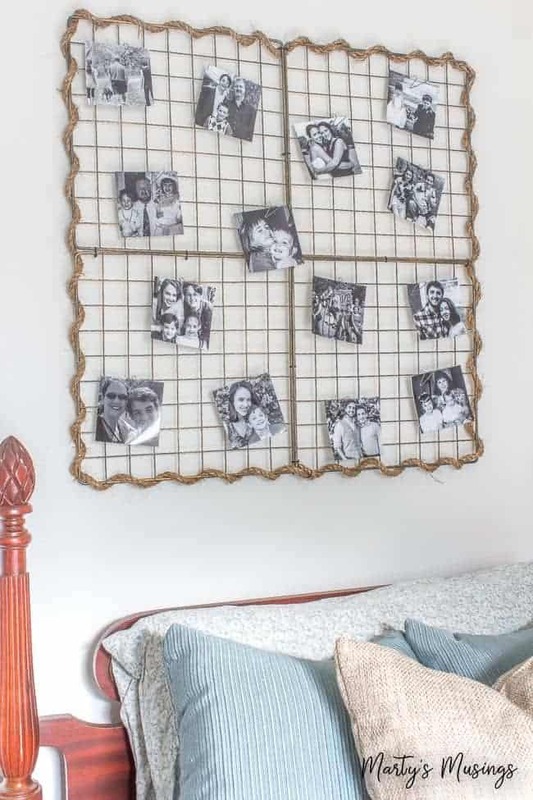 One of my favorite creative DIY projects was this photo frame with black and white family pictures. It’s actually a metal crate that was taken apart and wrapped in jute around the edges. Pretty clever, don’t you think? That vintage table lamp? Would you believe I found it on the side of the road? Yep! It was in a pile of junk ready for trash pickup but I grabbed it and it’s perfect for the room. Sadly, my hubby had an unfortunate accident with the shade and $18 later my FREE lamp wasn’t quite so free! Our now guest bedroom has only a small closet with built in drawers, which was totally inadequate when our two boys were sharing a room. Now it’s a perfect place for extra grandbaby toys and thankfully this no sew burlap curtain hides the mess! 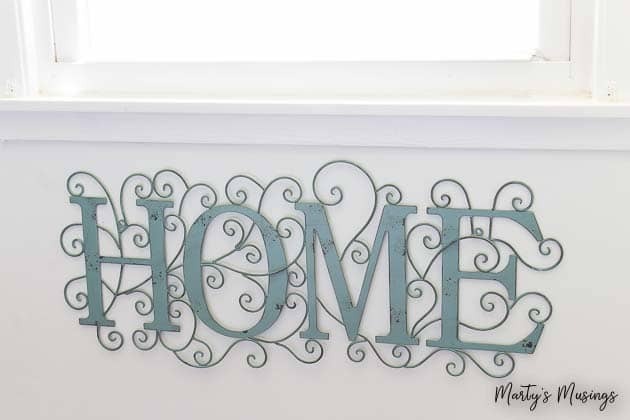 Did you notice the distressed turquoise metal home sign? One of the few new accessories in the room, it serves as a reminder of what’s really important. But I later sent Tim back to get it because it just fit the room and I had.to.have.it. I never do that, y’all, but I don’t regret it one bit. When you rarely, if ever pay “real money” to decorate your home, sometimes a splurge is in order! Now for the rest of the tale behind this room transformation. My son did come back home to live for a few months before he graduated from high school a few weeks ago. He has since moved on to figure out his life as an adult and our hope is he will remember the family that raised and loves him. Life isn’t easy at that age in the world we live in. Who am I kidding? It’s not easy no matter your age. Even though my son doesn’t live with us anymore his room is still filled with memories and treasures of our life together. Life is messy. Families are messy. I’m thankful God loves me even in my brokenness. 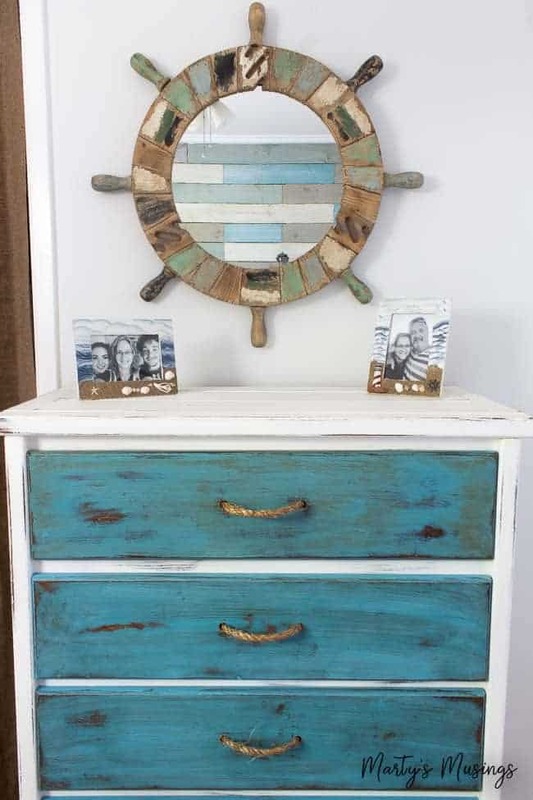 Since I know everyone can’t shop at yard sales or thrift stores I’m including some links to similar coastal home decor items that you might like! Thanks, Katie! Hope all is going well with your family. Hi, Mary. Thanks so much. I do love yard sales and it sounds like we’re kindred spirits! Hope you’ll signup to receive my new posts and tips! Your post has touched my heart and your guest room is so beautiful and peaceful. Love it. Thanks so much for the sweet and encouraging words, Inge. Have a blessed day!